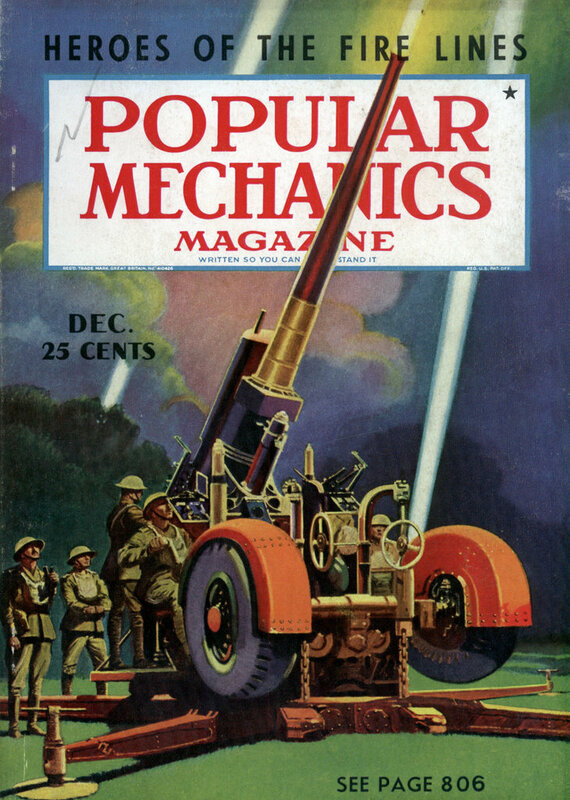 I just love the pictures in these color sections Popular Mechanics used to have. I think they are all hand colored, but I’m not sure. LITTLE by little, aviation engineers are revolutionizing the art of flying. Today’s big transports are vastly improved over those of only a year or two ago although an untrained eye can hardly spot the differences. Scores of slight improvements in power plants, instruments and construction have materially increased efficiency. Among the things looming for the near future are opposite-turning propellers for two- and four-engined airplanes. Gearing all outboard propellers to rotate inwardly at the top suggests higher speeds and greater stability. Another idea under development is to divert the flow of air used for engine cooling into the exhaust pipes, with the thought that the flow of air will have an extractor effect on the exhaust gases, contributing to engine efficiency. Various ways of putting the exhaust gases and radiator cooling air to work by making them contribute a rearward thrust are also being studied. Greater engine efficiency is being sought in a solid fuel injection system that would eliminate the present types of carburetors. New ways of controlling airplanes in flight are also receiving attention. Two controls instead of three, provided by coupling aileron and rudder action, seem to have possibilities. A British invention dispenses with the present ailerons completely. In this system a hollow tube crisscrosses from each leading edge of the wing to the opposite trailing edge, permitting the pilot to obtain aileron control by opening or closing the tubes to make use of the difference in pressure existing between the two edges of the wing. Localized boundary layer control at the wing tips is another suggestion for providing aileron action. If present ailerons continue to be used, they may be made more effective by arranging some means of sealing the gap between the wing and the aileron surface to prevent leakage of air at that point. Completely smooth wing and fuselage surfaces would add 273 extra horsepower to present transports, the National Advisory Committee for Aeronautics has determined. Rivet heads, overlapping joints and surface roughness resulting from working tolerances and factory workmanship offer as much as forty-two per cent more drag than perfectly smooth airfoil shapes. Manufacturers are beginning their ” cleanup” campaign by using flush-type rivets but high manufacturing costs may prevent them from ever achieving perfect wings in metal construction. Every detail counts. Even the drag of ordinary rubber boot de-icers along the leading edges of wings has been studied, and de-icer drag has been reduced from an original sixteen per cent to nine by mounting the boot in a flush position instead of lapping it over the leading edge. Engineers are studying the phenol-formaldehyde resin type of plastics as a possible new material for airplane surfaces that can be molded into smooth and efficient airfoil shapes. Blind landings made by instruments alone will be normal procedure within a year or two. Thousands of such landings have already been made safely, with short-wave radio signals orienting the pilot toward the field and other signals telling him when to start the “let down” glide in a safe landing attitude with flaps and landing gear extended. The new tricycle landing gear makes instrument landings easier, reducing the bounce of a hard landing, allowing more immediate braking and permitting planes to land across the wind. Many radio possibilities are being explored. One patent provides “panoramic reception” of several radio compass signals visually and simultaneously on a cathode ray tube indicator. Static is slowly being wiped out although a moving airplane is an almost perfect static-generating machine. Shielded loop antennas have eliminated some of the static. United Air Lines is experimenting with wires with sharpened ends trailed from the tail of the plane to provide leakage paths along which static charges may be dissipated. Ultrashort radio waves in which static conditions are less acute are to be adapted to air line use. Beginning next year, much lower wave lengths will be used for plane-to-airport communication over short distances. Ultrashort-wave radio marker beacons will help the pilot with his navigation. Fan beacens that set up walls of short-wave warning signals will mark the edges of mountainous areas in the vicinity of airports. Automatic pilots are being connected directly to the radio beam receivers so the robot actually keeps the plane on its course as well as attending to the mechanical details of flying. Research is being conducted on various ways of providing a pilot with “fog eyes.” What is wanted is an instrument that will measure the distance to the ground. Present altimeters show the height of the plane above sea level but not the ground contours beneath the plane. Short radio waves, infrared rays and sound waves reflected from the plane to the ground and back again are being studied. Engines are sturdier even though they are developing more power than a few years ago. Automatic oiling systems have eliminated frequent overhauls and increased engine reliability. The heavy drag of a ” windmilling” propeller when an engine goes dead in the air has been reduced almost to nothing by the Hamilton hydromatic full-feathering propellers. By turning a switch the pilot can turn the blades to point directly into the wind. Propeller blades that may be rotated through 120 degrees of a pitch have been developed in France to enable flying boats to maneuver astern on the water. Designing a transport is such a complex job that no one man can do it all. Specialists in wing construction, tail group design, and landing gear assembly work side by side. The cockpit alone needs the attention of several experts and hundreds of minor details require intensive study. The exact location of the pilot’s seat, the angle of the windshield and the shapes of the control knobs are all important. Different control handles are given different colors and shapes so the pilot invariably can recognize the one he seeks. His seat must be close to the windshield to give him wide angle vision, yet he must be able to slide out of the seat easily without disturbing the controls. In the past, pilots were sometimes confused by lights reflected on the cockpit windows. Lights on the ground behind sometimes seemed to be ahead of the plane. Placing the windows at exactly the proper angles prevents such reflections. Pilots in the past also were almost blinded by rain or snow pounding against the windshield while making night landings during storm conditions. Designers solved that trouble in an adroit way. Instead of trying to keep the moisture out of the cockpit they let it in. Now when a pilot prepares to land during a storm, he slides open a side window and a windshield window, allowing rain or snow to sweep in one window and out the other. Sitting behind the blast of wind, the pilot can see forward and rarely receives more than a few drops from the controlled storm that invades the cockpit. The windshield is completely waterproof when closed and can take a pressure of one pound per square inch at 200 miles per hour without leaking. Dumping fuel in flight no longer is the hazard it was. Improved vents dump the fuel free from the body of the plane and prevent any chance of the fuel igniting from collision with tail surfaces. The flame front in a combustible mixture of gasoline and air travels only forty miles per hour, hence even if the cloud of dumped fuel happens to catch fire from a static spark the plane remains safe because it is trav-eling too fast for the exploding flame front to catch up. More than 1,000,000 passengers per year are carried on domestic air lines and the number of accidents in relation to the number of miles flown is decreasing steadily, yet the aviation engineers are never satisfied. They are constantly trying to make the big transports safer and more efficient than ever. this article uses 2 different color schemes. as it was printed in folders of 8 pages, 4 pages in each side of the paper sheet. pages 1, 4, 5 and 8 were printed in 4 special colors, red, blue, yellow and black, but it is not a CMYK optical separation. the pictures are colored using the “fake color” technique, using combinations of the special colors. pages 2, 3, 6 and 7, on the other side of the sheet, were printed in 2 special sort of complementary colors, blue and orange (note the text in blue, not black), that when skillfully mixed, with the same “fake color” technique, allows an almost black color. this process was done painting the separation films by hand. the effect, on illustration or pictures, is amazing. today we get a similar effect in photoshop with the “duotone” mode. When I worked on underground papers in the 60s we used a similar technique to keep costs down. Note that there are 4 blue pages and only three 4-color images (the last page is a standard B&W one). I’m guessing that the missing page was probably an advertisement which paid for the cost of a four run printing. Thanks Glaessa, I’ve wondered for some time how they did that. 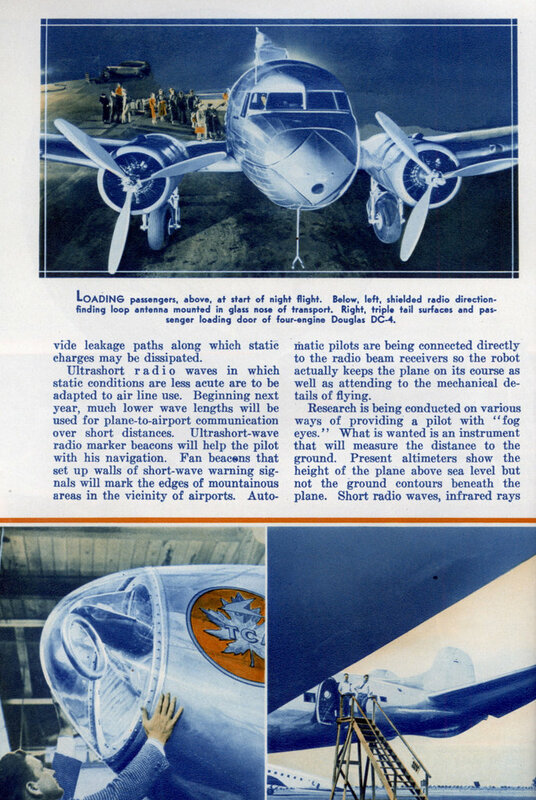 Page 6 figure in bottom right: caption says “Triple Tail Surfaces and Passenger Loading Door of Four-Engine Douglas DC-4”. The airplane is actually a Lockheed Constellation. The Douglas DC-4 was a single tail aircraft.